Are you guys ready for the good stuff?! 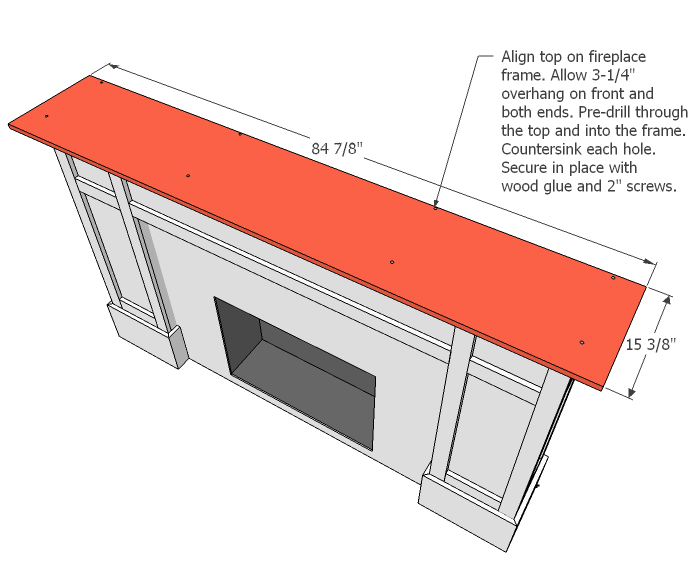 Yesterday I showed you how to build the hearth, or base of a movable faux fireplace. Today, I'm sharing the star of the show- the fireplace itself! Since this fireplace/over-mantle set up doesn't need a chimney or flue, you can place it on pretty much any wall you'd like. My amazingly talented photographer/videographer friend Kindra is the lucky lady to own this project. She chose a simple, craftsman style design, but you could adjust the moulding to fit whatever style you like. 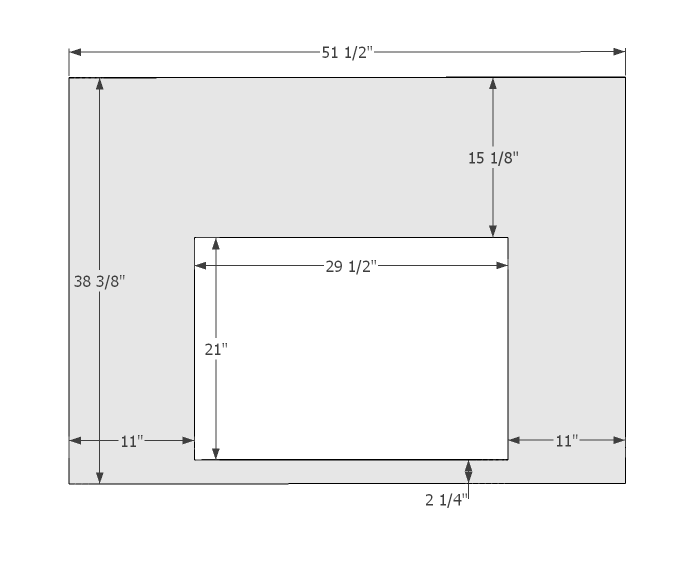 (4) 1 x 10 x 96"
(9) 1 x 3 x 96"
(1) 1 x 8 x 96"
(8) 3/4" plywood @ 11-1/4" x 47-7/8"
(1) 3/4" plywood @ 11-1/4" x 51-1/2"
(1) 3/4" plywood @ 15-3/8" x 84-7/8"
(1) 2 x 4 @ 51-1/2"
(2) 2 x 2 @ 38-3/8"
(2) 2 x 2 @ 8-3/4"
(3) 2 x 6 @ 9-1/4"
(8) 1 x 3 @ 47-7/8"
(1) 1/4" plywood @ 51-1/2" x 38-3/8"
(1) 1/4" plywood @ 31" x 22-1/2"
(2) 1 x 8 @ 21"
(2) 1 x 8 @ 31"
1. 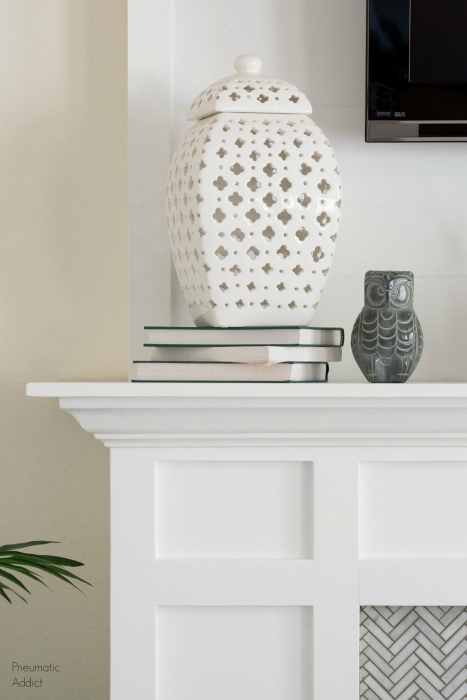 Cut the boards and panels listed above, but don't cut the rest of the trim or crown moulding! 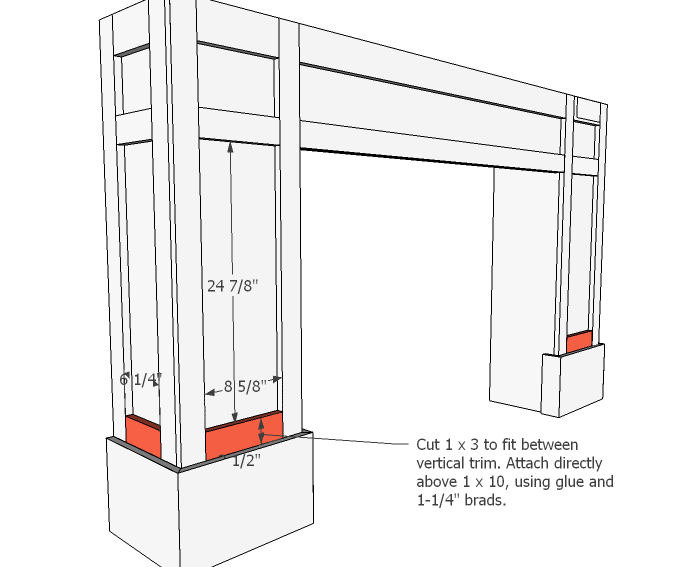 Build the base first, take exact measurements, THEN cut. 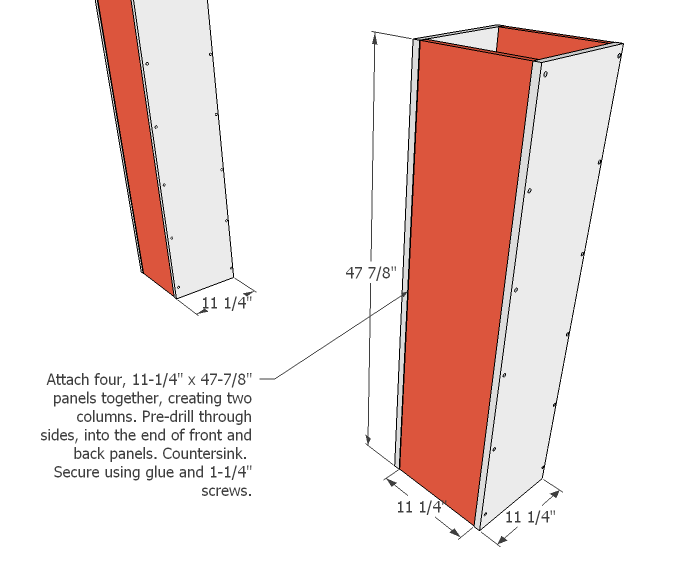 Attach four, 11-1/4" x 47-7/8"panels together, creating two columns. Pre-drill through sides, into the end of front and back panels. Countersink the top of the holes to accommodate the screw heads. Secure using glue and 1-1/4" screws. 2. Connect columns with 1 x 12 face board. Attach with glue and 1-1/4" screws through pockets holes. 3. 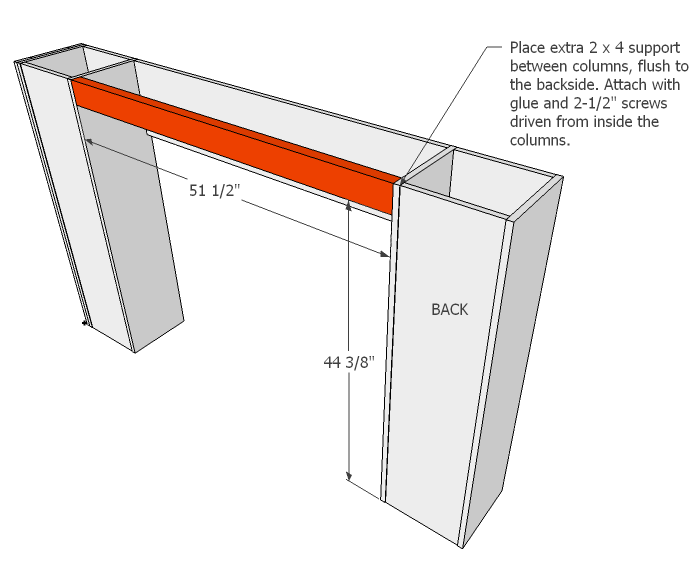 Place extra 2 x 4 support between columns, flush to the backside. 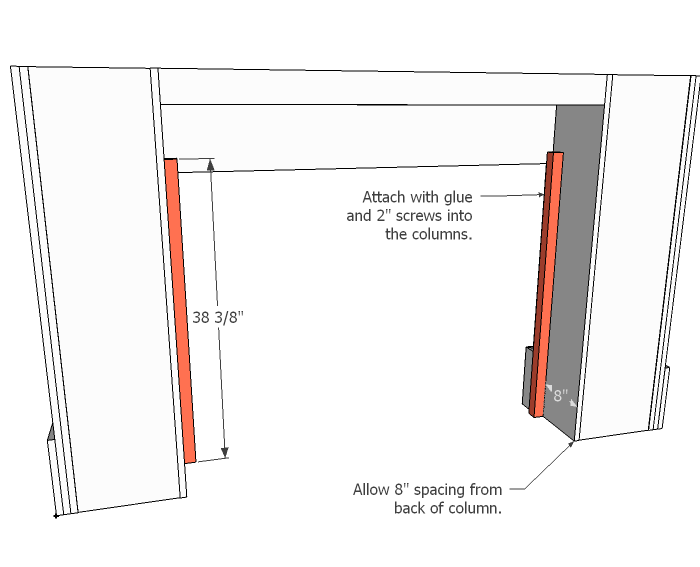 Attach with glue and 2-1/2" screws driven from inside the columns. and 1-1/4" brads. If the trim doesn't match up perfectly with the column, it's okay. Make sure the gap is at the top so it will be covered by the crown moulding. 5. Attach 1 x 3 vertically, flush with the outside edges. Secure using glue and 1-1/4" brads. 6. MEASURE BEFORE CUTTING! 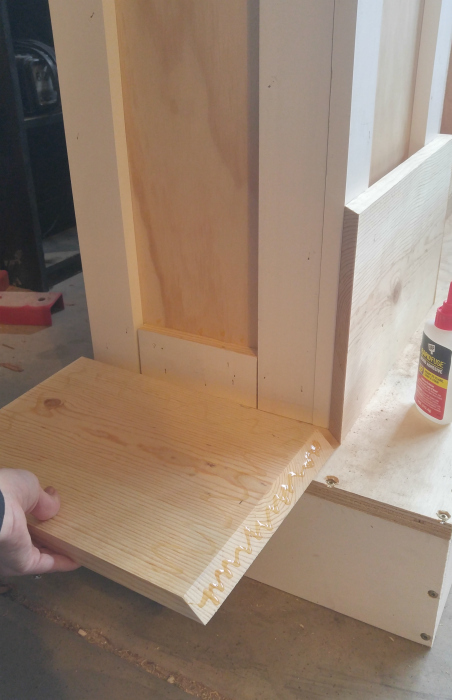 Attach 1 x 4 between vertical trim, flush to the top of the columns, using glue and 1-1/4" brads. 7. 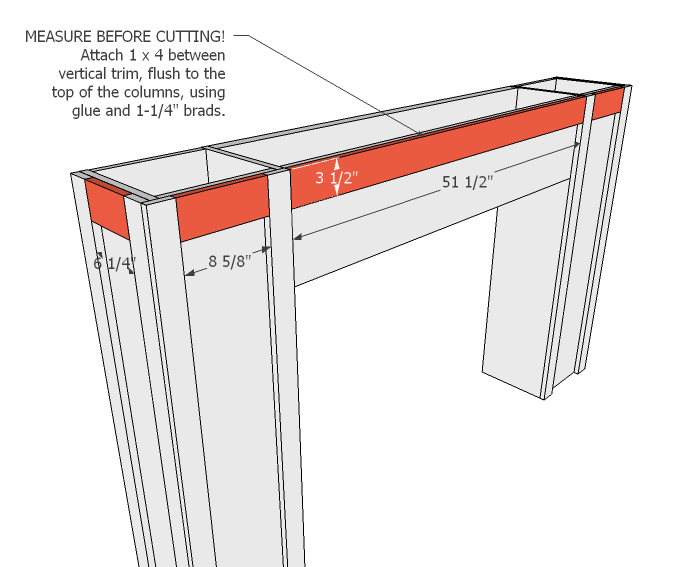 Measure space between vertical trim before cutting horizontal lengths. Attach with glue and 1-14" brads. bottom. Attach with glue and 1-1/4" brads. 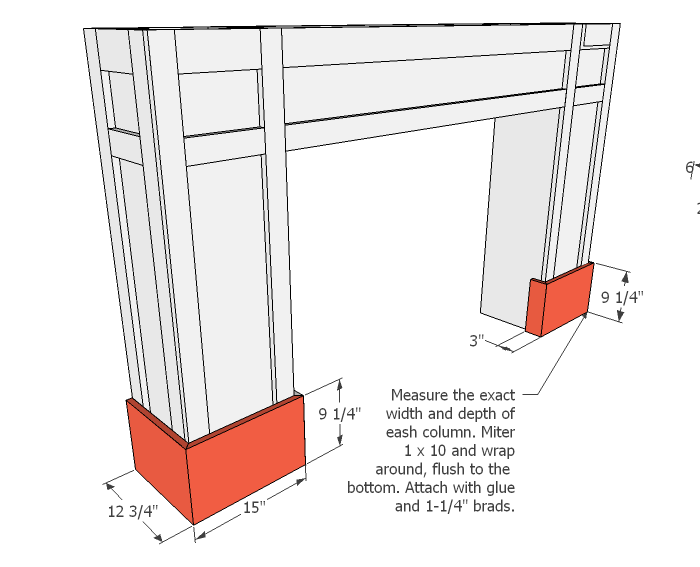 The width of the column should be equal to the length of the short side of the miter cuts. The front board will be mitered on both ends. The sides will meet with a miter but end with a square cut against the back. Don't forget to add glue to both sides of the joint. 9. Cut 1 x 3 to fit between the vertical trim. Attach directly above 1 x 10, using glue and 1-1/4" brads. back of column. Attach with glue and 2" screws into the columns. 11. 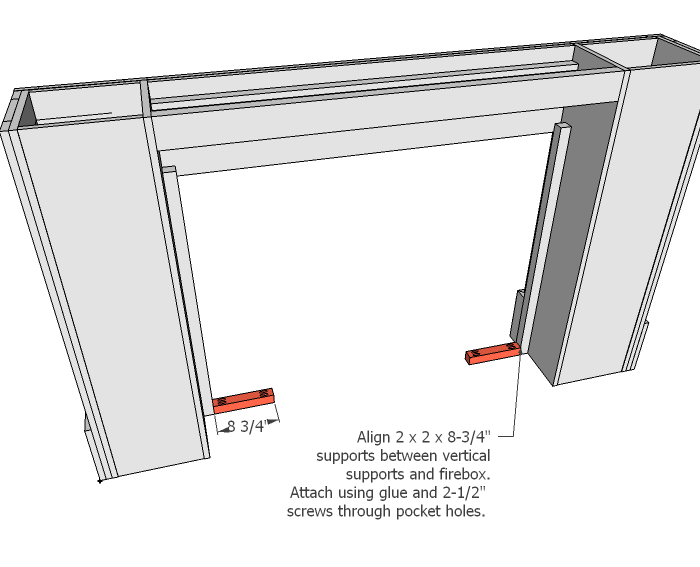 Align smaller, 2 x 2 x 8-3/4" supports between vertical supports and firebox. Attach using glue and 2-1/2" screws through pocket holes. 12. 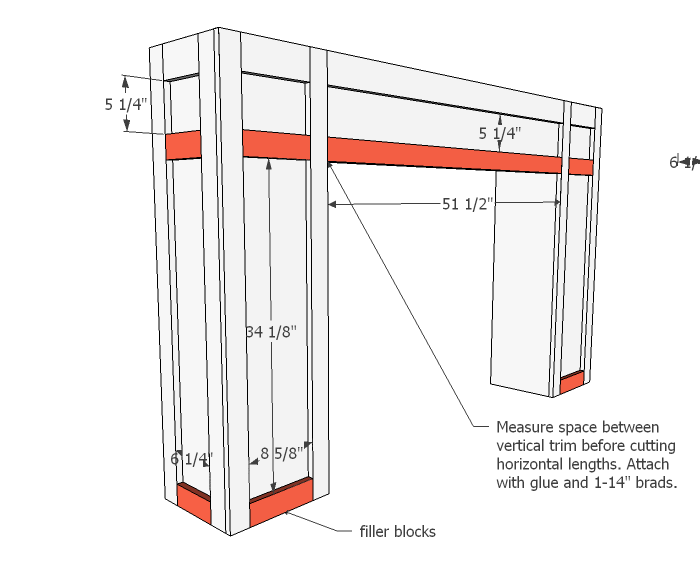 Cut the 51-1/2" x 38-3/8" x 1/4" with a table saw or circular saw. Use a straight line to mark out the opening. 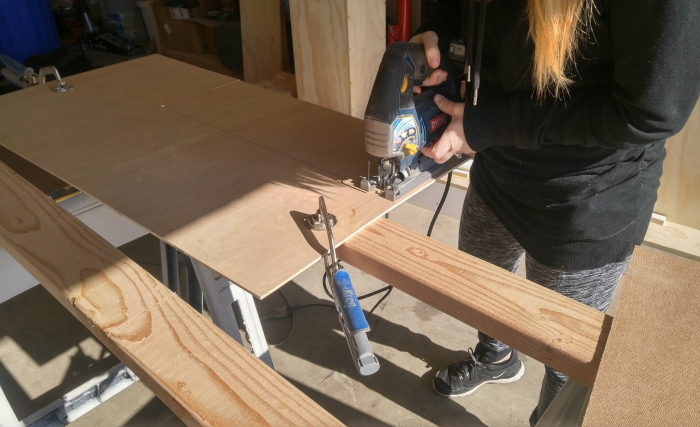 Drill pilot holes and cut inner rectangle using a jigsaw. 13. Slide 1/4 plywood face down from the top, flush against the vertical and small supports. 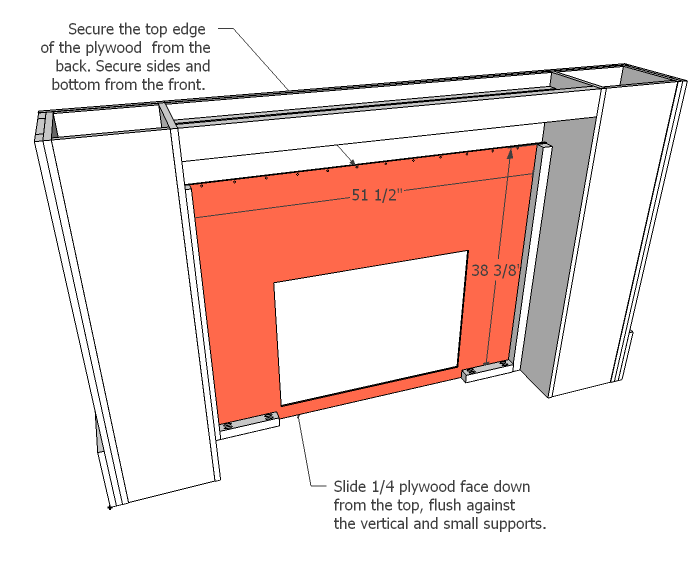 Secure the top edge of the plywood from the back. Secure sides and bottom from the front side of the fireplace. 14. Create the firebox. 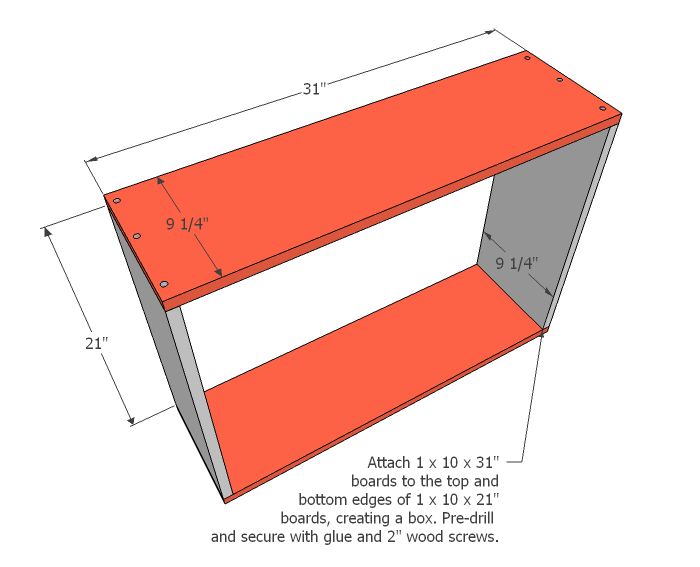 Attach 1 x 10 x 31" boards to the top and bottom edges of 1 x 10 x 21" boards, creating a box. Pre-drill and secure with glue and 2" wood screws. 15. 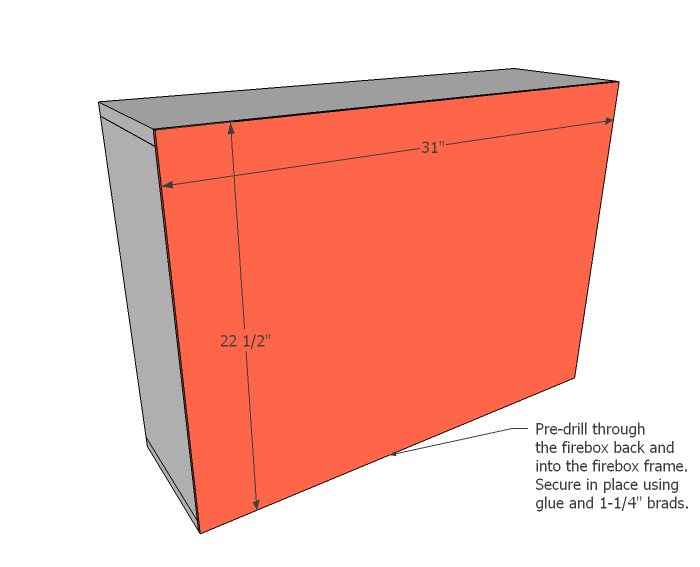 Cut the firebox back using a circular saw or table saw. Pre-drill through the back and into the firebox frame. Secure in place using glue and 1-1/4" brads. 16. 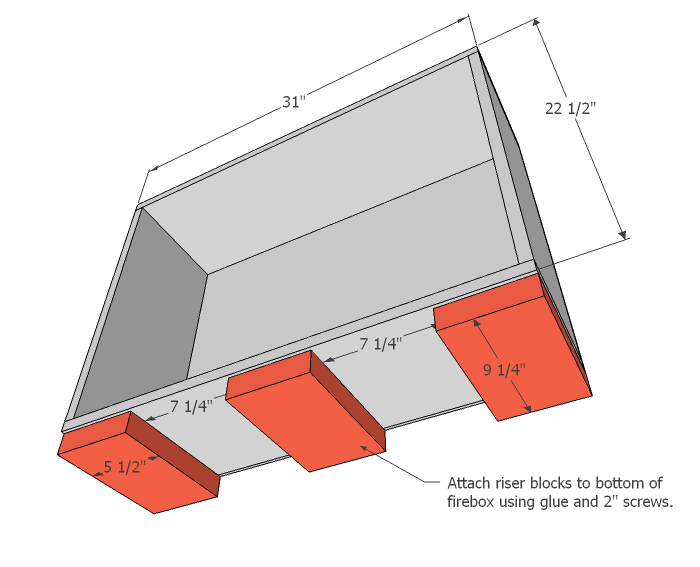 Attach riser blocks to bottom of firebox using glue and 2" screws. 17. If you are building the fireplace hearth as well (which I recommend), you'll want to place the fireplace up on the hearth at this point. Slide firebox and lift blocks into place, flush with the plywood face. 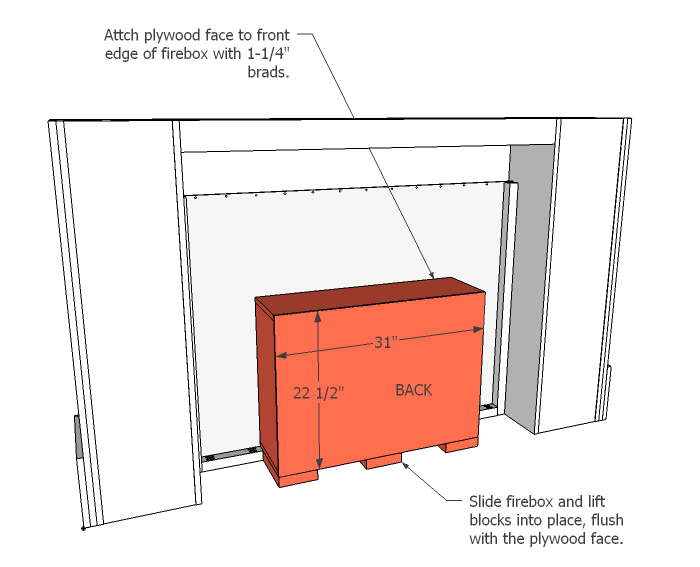 Attach plywood face to front edge of firebox with 1-1/4" brads. 18. Cut the top panel to size. Apply iron-on edge banding, trim and sand the edges. 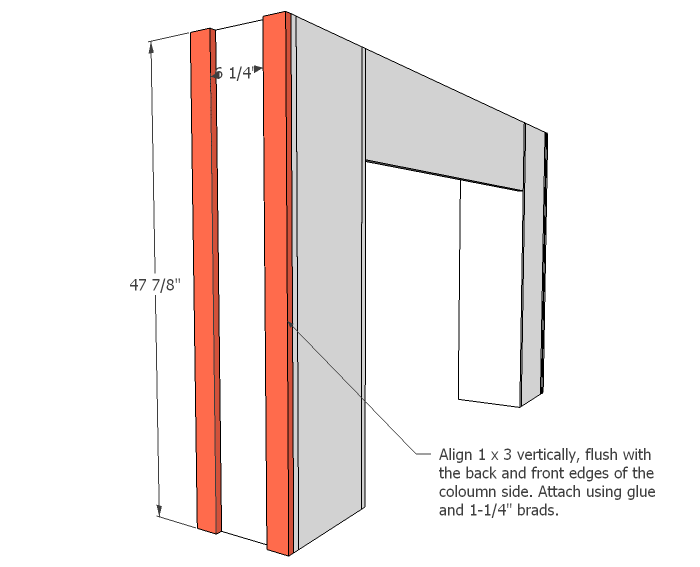 Align top on fireplace frame. 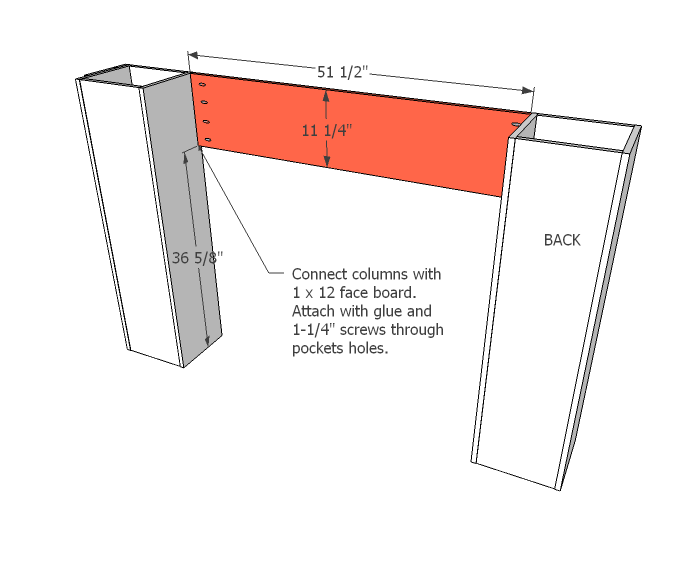 Allow 3-1/4" overhang on front and both ends. Pre-drill through the top and into the frame. Countersink each hole. Secure in place with wood glue and 2" screws. Fill the screw holes and sand smooth once dry. 19. 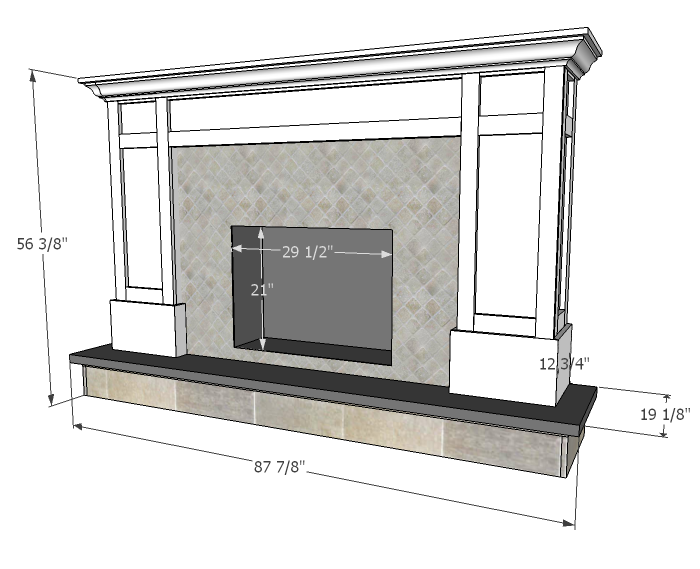 Measure the exact width and depth of the fireplace body. Mine was 82-7/8" x 14-1/4", but make sure you measure yours after it is assembled. Cut the crown moulding to fit. 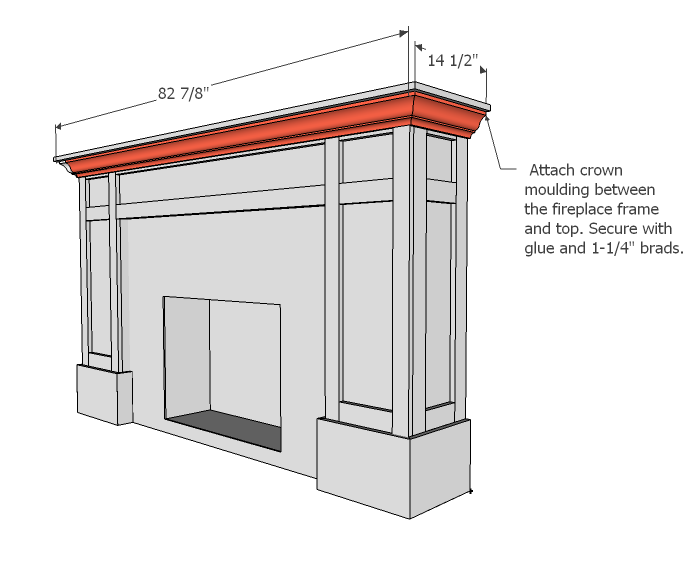 Attach crown moulding between the fireplace frame and top. 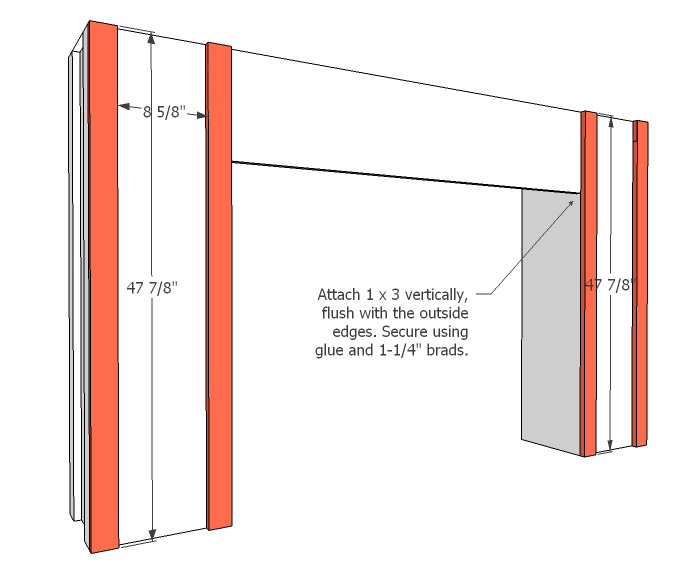 Secure at the top and bottom edge with glue and 1-1/4" brads. 20. With the main fireplace built, you can now work on all the pretty stuff. I would highly recommend painting before tile. 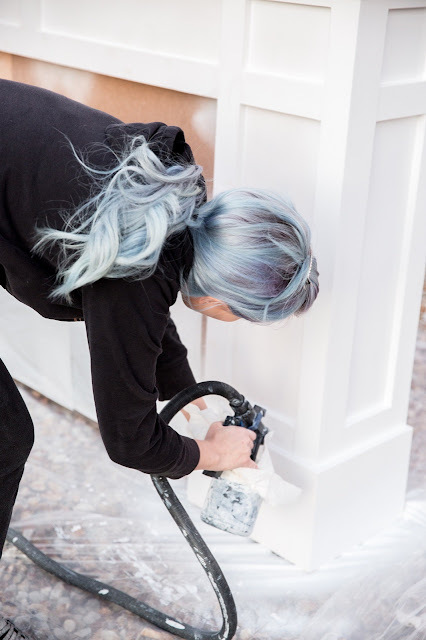 Once the paint is dry, apply decorative tile to the plywood face. Kindra chose an electric fireplace insert from amazon. We made a simple frame from panel cap moulding to cover the raw edges of the tile and make the insert look built-in. Kindra absolutely loves the electric insert! It gives a nice glow and actually puts out a good deal of heat. 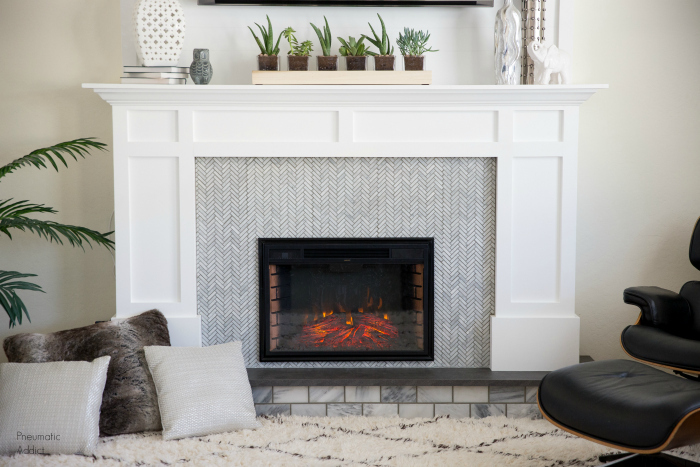 If you're not a fan of electric fireplaces, you could make the firebox look amazing with some faux brick and black paint! 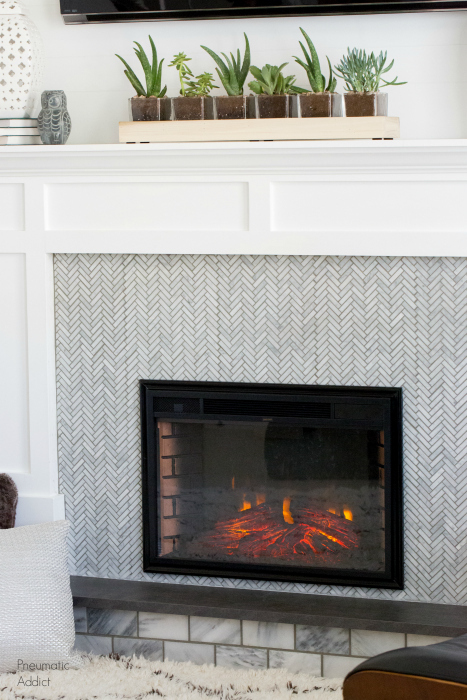 We found both the subway marble tile on the hearth and the herringbone at Home Depot. I've shared with you my great loathing for tile work. You know I must really love my friend. This was her first time working with tile but she didn't make it easy on herself. I wouldn't recommend this tile for a beginner. Tiny, natural stone, herringbone tile isn't the easiest to cut, but it looks oh so good installed! Make sure to read Part One: Hearth, and stop by tomorrow! I'll be sharing the last set of building plans for the overmantle. Ready to get building? Pin the image below to save the idea for later! this is BEAUTIFUL!! You are such a talented designer and builder. Thank you for sharing!! This is a great tutorial!!! Love your spirit and your creativity!